For centuries the German language is considered as very historical, culturally rich language. It had been in and around for years and today it’s also one of the most spoken languages in business across the world. Moreover, if you are a student or a professional studying German language then there are certain online tools like grammar and punctuation checker, sentence or German grammar checker that may come in handy during these days and offers you plenty of benefits which in turns will help you in succeeding your studies or business. However one must be aware of this fact that the most common hurdles while writing any German paper or content, is to maintain the accuracy of the grammar especially comprehending your message clearly to the audience. German Grammar corrector what is it? These types of German language correctors and grammar checkers are always pretty handy when checking your articles, blogs, presentation and assignments. And definitely you want to give it a chance, so if you like to use any of these tools, then all you have to do is simply just copy and paste your whole written content into the text box/interface. After that start the process by clicking on ”check German grammar” button and run the tool to find all the possible errors in your paper. So just within few seconds, you are all set to get your results and quickly fixing those spotted mistakes your paper, report, assignment or whatsoever it is ready to be submitted to your professor or superior without any worry. Other than this there are many obvious benefits of using these online German sentence correction tools like it is possible for you to gain so much from business or studies while using such powerful and amazing tools. Therefore don’t hesitate anymore to use the tools, as you never know what these tools can do for you. Hence in order to give our readers a thorough and deep insight about this tool let’s have a look at one of the best available German grammar tool. 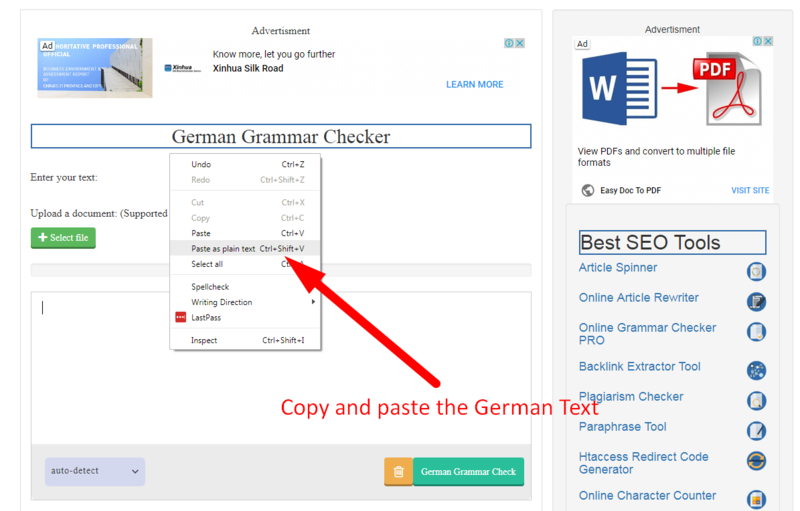 SEO Magnifier German Grammar fixer - is it useful? You might have heard about online SEO Magnifier having a variety of Seo related tools and this German language correction tool is now the latest addition in their long list of tools, which is today used by thousands of freelancers, German bloggers and writer working on their content in German language. In fact, the content itself is the key on which all the search engine like Google rank your site. So this implies if your content is of high quality, easy and eye catchy to read then for sure it will appear at the top in search engine. However, if you compromise on the quality of the paper then don’t expect it even on the first page of search engines. Grammar plays another important role in case of writing content for any website. 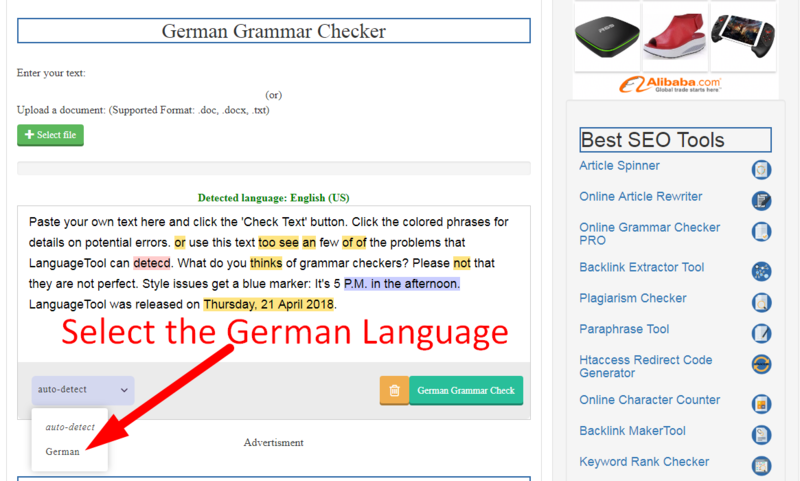 So in order to write well and unique, you must need to have very good understanding of grammar and this German Grammar Checker tool is going to help you out in that case. This tool is specially designed by keeping in mind all the specifications of German language, so that all the necessary requirements of writer, bloggers and other professionals working/writing in the German Language, must be fulfilled. Why should I use the german grammar corrector? No doubt the German Language is perhaps one of the finest and grammatically tough languages on the globe. And it can prove to be a real tough task in case if it’s not your native language. That’s why this tool by SEO Centre is definitely here to help you anyway in improving your German grammar. Although there is no rocket science in using this tool as it is very easy and user-friendly too. It makes your content more accurate and allows to correct any type of grammatical mistakes because it thoroughly analyses figure and parts of speech like noun, pronoun, verb etc. along with checking spellings. So the main plus point that makes it better compared to other free or premium online tools is, It don’t do only the spell checking rather it provides users a complete grammar, style and spell check by highlighting the mistakes in different colors. 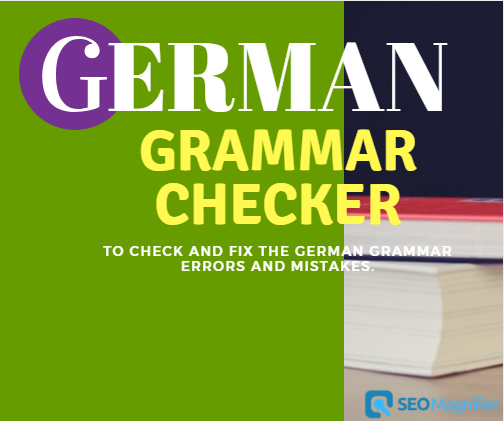 This German grammar tool by seo magnifier is considered as one of the finest tool available on the internet and it’s completely free and even works better than some of the purchased ones. 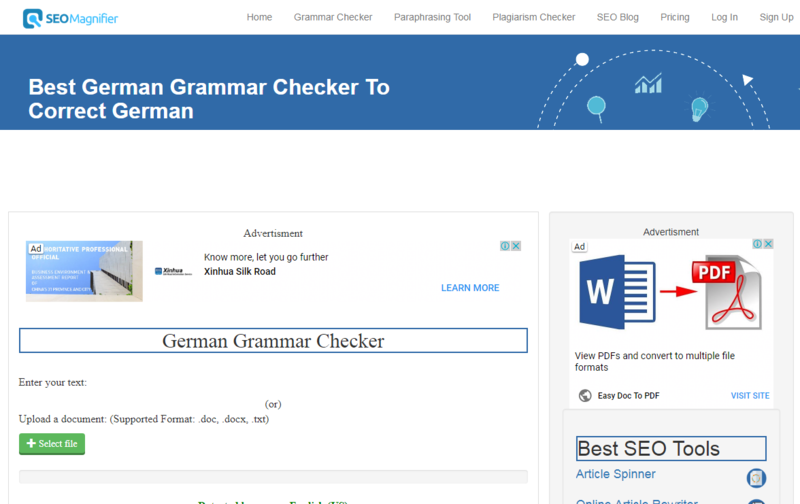 How to use SEO Magnifier german grammar and spell check online free? Well, this tool is quite easy to operate as it works on a very simple basis. 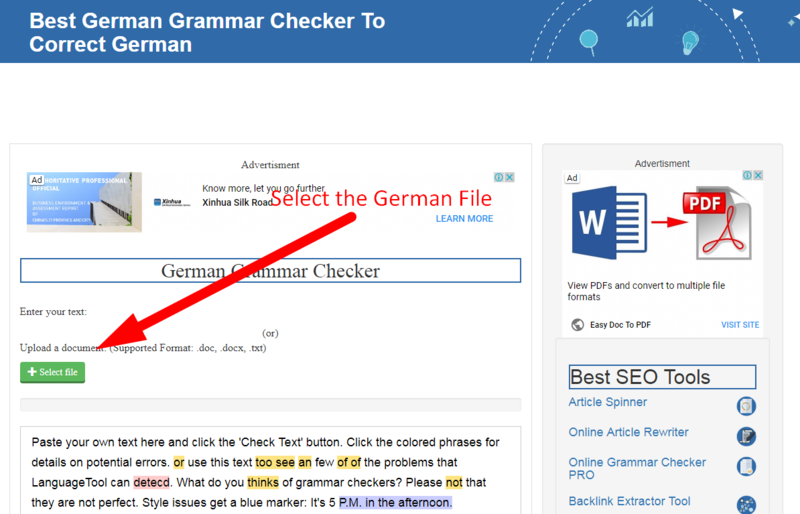 Go to the german grammar check tool page. Like after you copy and paste your written German content into the given text box. Or Upload the document file using "select file" option. Click "Check German Grammar" Button. Soon it works on analyzing your paper deeply and starts finding the spell, style or grammatical errors throughout the text. And since it is also superfast, therefore, it functions so quickly and spot all the mistakes in no time. That means you won’t need to wait anymore for longer periods as you can have your results within the seconds. 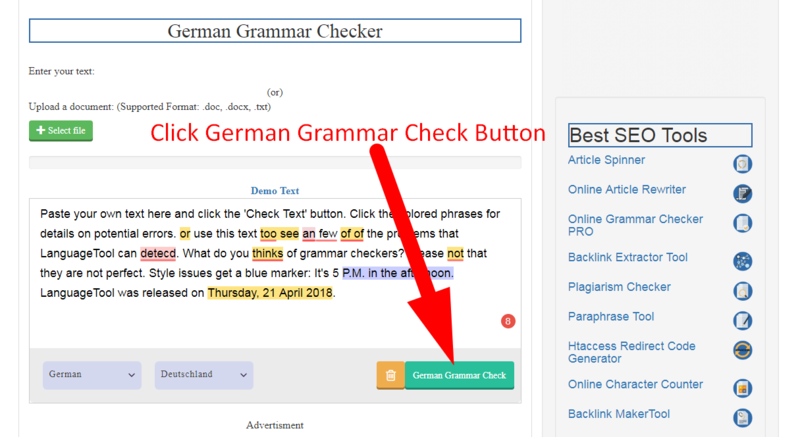 Conclusion: In short, you can take an amazing advantage from such an innovative online tool like SEO German checker, as it will help you in ensuring and improving the consistency, proficiency and the superiority of your content, article or paper written in German language without using any extra time, money or effort on that. Thus on a serious note these types of online grammar checkers can provide you a hell lot of benefits as they check text and perform spelling or grammar checking to correct you German grammar so that an unmatched accuracy, precision and quality of your paper should be ensured. You can also check for the grammar corrector which support up to 26 languages including spanish, russian, german, French and many more.